Swashbuckling pirates are a favorite of kids everywhere, and a pirate theme party is a popular choice, especially for young boys. 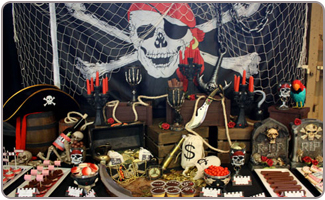 If you are in search of some fabulous pirate birthday party supplies and some fun Pirate birthday party ideas, you can turn that special day into a high seas adventure. Look for a party venue that gives your buccaneers plenty of space to move around, as pirate parties tend to bring out the urge to have mock sword-fights and run around. Pirate party games often require lots of space! If you have water nearby such as a river or lake, look into cruise boats that might offer party packages – what better way to bring pirate birthday party ideas to life than actually being on the water? Watch some pirate movies like Pirates of the Caribbean for inspiration and more pirate party ideas for kids. If you have a daughter who loves pirates, there are some pirate birthday party ideas that can make things a little more girly, including pink pirate birthday party supplies. A costume party is a great way to really bring the pirate theme to life; if your friends don't have pirate costumes, provide hats and eye patches for all. 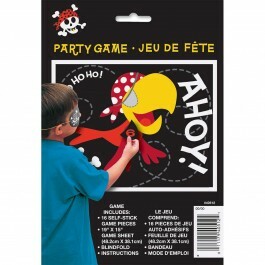 If you are looking for Pre-printed Pirate birthday party invitations in India, browse from our great selection of pirate theme party supplies are the quick and easy way to get the word out. You can make your own pirate party invitations at home with some construction paper. Cut out the shape of a boat from brown paper and write all of the details on it. Glue on a Popsicle stick to make a plank. 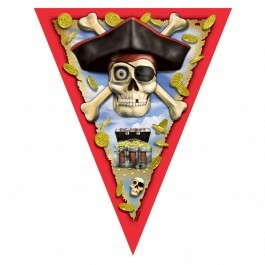 Pirate images are available in abundance online. Download them and create your own pirate invitations, then print them and send them out to your child's guests. 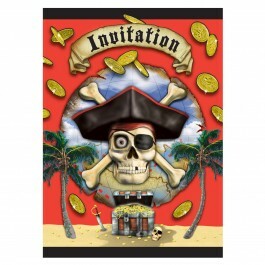 Use pirate wording in your invitations for fun. "Avast ye landlubbers", "Walk the plank!" 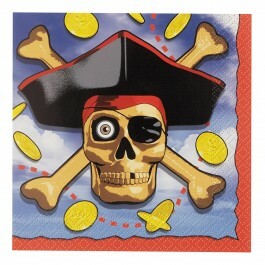 and "Shiver me timbers" all fit well into a pirate theme party invitation. 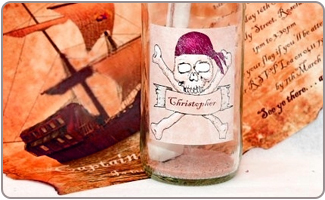 You can use some old soda bottles, paste a sticker or cut out of swashbuckler, skull & crossbones on it, and in write all party details on a old torn out paper, roll it and place it inside the bottle. Set up a treasure hunt with a map where X marks the spot. 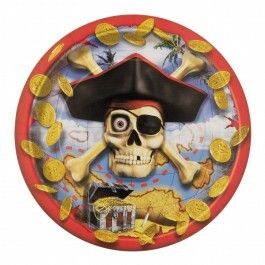 Send out teams of pirates to locate a buried treasure you have hidden ahead of time. 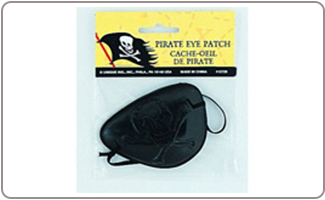 Play pin the eye patch on the pirate instead of pin the tail on the donkey for a pirate theme party twist on a classic. Have wooden leg races: the children must race with one leg held out stiffly as though made of wood. These races make hilarious pirate party games. Fill wooden chests with dry beans and hide fake jewels among them. Set a timer and have the kids dig through the beans to find the buried treasure. Whoever finds the most treasure in the allotted time will win. 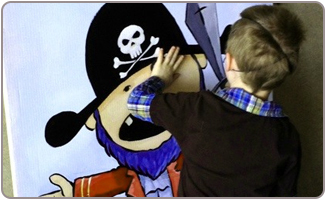 Let each child draw a picture of their own pirate and give him a pirate name. The child can then go by that pirate name for the rest of the day. 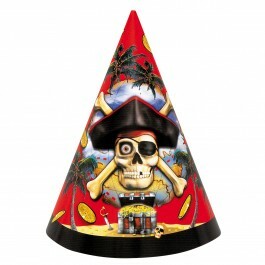 Hang a Pirate Ship Pinata filled with candies and other goodies and shower it upon buccaneers. 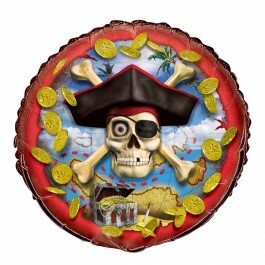 Give out small bags of chocolate coins as party loot for departing buccaneers. If you buy hats and eye patches for everyone to wear at the party, let them take home their gear as the return gifts – that way it does double duty. Serve up "pirate grog" – without the alcohol of course – by making a party punch and serving it in mugs. 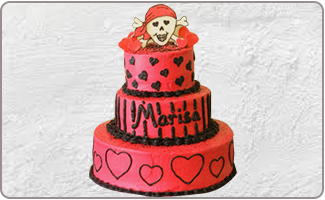 The perfect pirate birthday party cake is just a few steps away with an easy to use cake topper from our party supplies. Make a big pot of pirate stew and serve it with fresh baked bread – let the children tear off chunks of bread rather than slicing it for a rougher look and feel to the food. 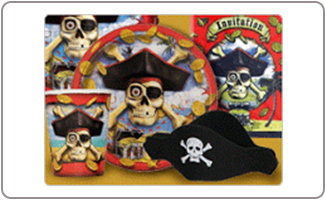 Choose from our large selection of Pirate birthday party decorations to turn your home into a pirate's haven quickly and easily. Scatter fake treasure around the room to make it look like a pirate hideaway where loot is kept safe. Use nautical themed decorations that give the feeling of being on a boat. Raise the pirate flag! Skull and crossbones flag hung at your door lets everyone know where the party is. 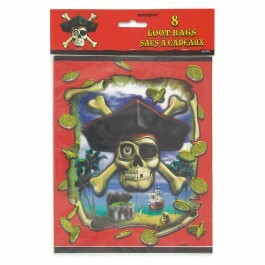 Black and white are good choices for balloons and streamers to match the pirate's skull and crossbones flag. 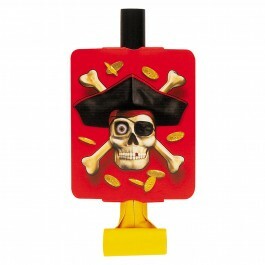 Don't forget to decorate yourselves and your guests with pirate eye patches, head scarves, or hats.